The only thing more difficult than surviving in the distant past is finding a reason to do so. This was one of the most engrossing science fiction books I’ve read in a long time. The shocking way in which the author decided to introduce the audience to this very strange thing that’s happened to Nicholas made it difficult for me to stop reading. What piqued my interest even more was how the pacing remained strong and consistent as the protagonist adjusts to his bizarre new surroundings. Harrowing is a good word to describe certain chapters, yet the periods of (relative) calm between calamities only made me wonder what could possibly happen next. There was a point early on in his adventures when I was confused by Nicholas’ narration. He describes himself as an ordinary, middle-aged man who appeared to be somewhat physically active in his previous life. It was odd, then, to hear him discuss going extremely long periods of time without any food or water in a hot and humid environment. It was never quite clear to me if his memories of this time period were accurate or if his physiology had somehow been altered during his journey to the past. I’m happy to occasionally suspend my disbelief with stuff like this if the plot calls for it, but it would have been really helpful to have a few more hints about what was really going on. Nicholas’ character development was well done. When I first requested this story I was fascinated by the idea of one person shouldering an entire novel. It’s not something that I typically see happening in this genre, but I’m always interested in checking out the less common approaches or tropes. There’s definitely something to be said for trying something new, and focusing on Nicholas so intensely was a very good decision! 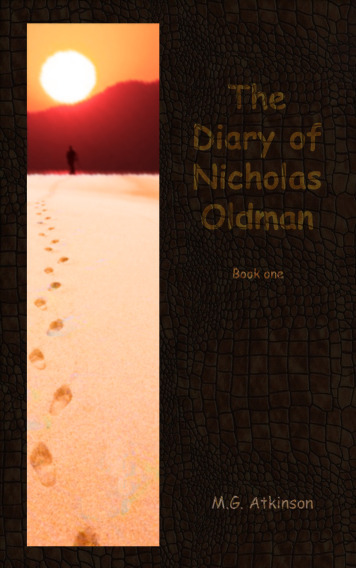 The Diary of Nicholas Oldman is a great choice for anyone who loves survival tales.